I’ve always thought publishing is a front for something else. After all, why would publishers put out so many books and then do nothing to market them? What’s their game? Now I think maybe the industry is getting a clue. This collaborative contest is the bee’s knees, the cat’s pajamas of online contests. And it’s a sea change in marketing by publishers. Wow! 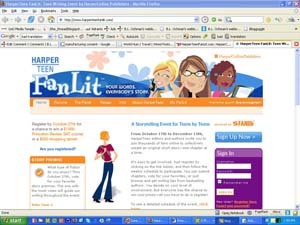 Harper Collins Teen FanLit is partnering with Fox Television Studios, MySpace, and FanLib for a collaborative writing and video contest. The resulting short story will be published by HarperTeen as an e-book prominently featuring the winning teen authors, and Fox Television Studios will produce an original animated or live-action 3-5 minute video webisode based on one teen’s submitted chapter. Among the prizes, a trip to New York to meet with Harper Collins authors and editors. Bravo! This is intensely clever and well thought out, and sure to have appeal to teens, who are all digital natives. FanLib, community-driven online consumer-generated media, lets mass audiences create stories and scripts collaboratively and democratically. The company, which also has done promotions with Pepsi, Avon and other publishers, was founded by film writer/director Craid Singer and former Yahoo! exec Chris WIlliams.